Today is the day I have dreamt about for a long time: getting to explore Ancient Angkor! I woke up at 7:30 a.m. ready for a great day touring western Cambodia. I grabbed a quick breakfast before I met met driver Sovonne outside. 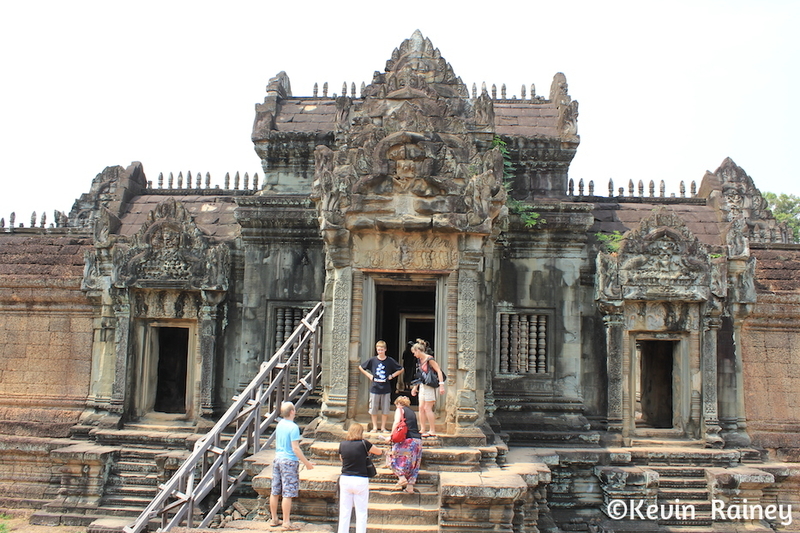 We left at 8 a.m. for a full-day tour of the surrounding Khmer ruins. Leaving Siem Reap, we passed the Killing Fields memorial in the city on our way out of town towards Phnom Penh. I saw a stupa or pagoda in a park that honored the victims of the Khmer Rouge’s murderous campaign. Honestly, this was not something I wanted to see. I have been to Dachau in Germany to see the concentration camps and I have seen the bones of slaves at a church in Brazil. I didn’t think I wanted to see the bones of victims of another genocide. It’s amazing to me that humankind has been making the same mistakes for hundreds of years by oppressing different ethnic groups and committing such unspeakable crimes. Europe, North America, South America, Asia, Africa and Australia … the names of such victims may be forgotten to history, but it seems like these monuments are a reminder so that such crimes never happen again. I would like to think that we are evolving as a species or becoming a better society, but I’m honestly not so sure. All I know is that more than 1 million innocent Cambodians were massacred by the sadistic Pol Pot and his sick Khmer Rouge regime. Several of the elder “brothers” are facing trial today and I only hope justice is served. Today many Cambodians still carry the mental and emotional scars of the genocide. But at the same time, it seems that many Cambodians are optimistic about the future. I don’t know if I have met such friendly people. While the country is much poorer than Thailand, it seems people here are even more welcoming. 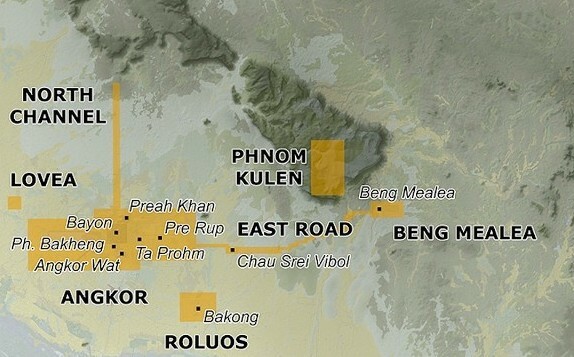 On the dusty dirt roads east towards Phnom Penh, I came to realize how vast the ancient Khmer civilization was. Angkor was the largest pre-industrial city in the world, spreading over more than 1,000 square kilometers. In fact, the ruins of more than 1,000 temples of Angkor rest amid jungles, farmland and rice patties. Sovonne drove me to several less visited ruins during the day. We started our morning visiting Pre Rup, east of Angkor Wat and located south of the East Baray (eastern reservoir). Outside the entrance, a sign explained that the temple restoration was being done by UNESCO and support from the Italian Government’s Funds-in-Trust project. The site is what they call a temple mountain originally dedicated to the Hindu god Shiva. Built in 961, the designed is similar to a stepped pyramid, perfectly square at its base and rising up to a central tower. 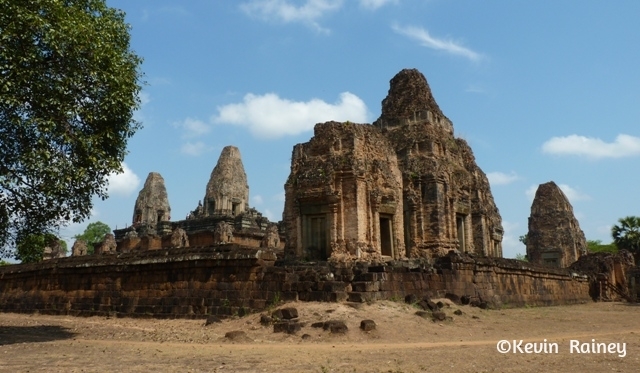 It was the second temple mountain after nearby East Mebon constructed by King Rajendravarman II. The temple was dedicated in 961, and time and the jungle have taken its time on the brick, laterite and gray sandstone. Gray sandstone is a little less durable than the pink sandstone in other Angkor temples, which has contributed to the degradation. However, you can visualize how it looked originally with its remarkable view of the countryside. It looks a bit like a mini Angkor Wat with its three spires inside the complex aligned north to south. The brick sanctuaries were also once decorated with a plaster coating, fragments of which still remain on the southwestern tower; there are some amazingly detailed lintel carvings here. 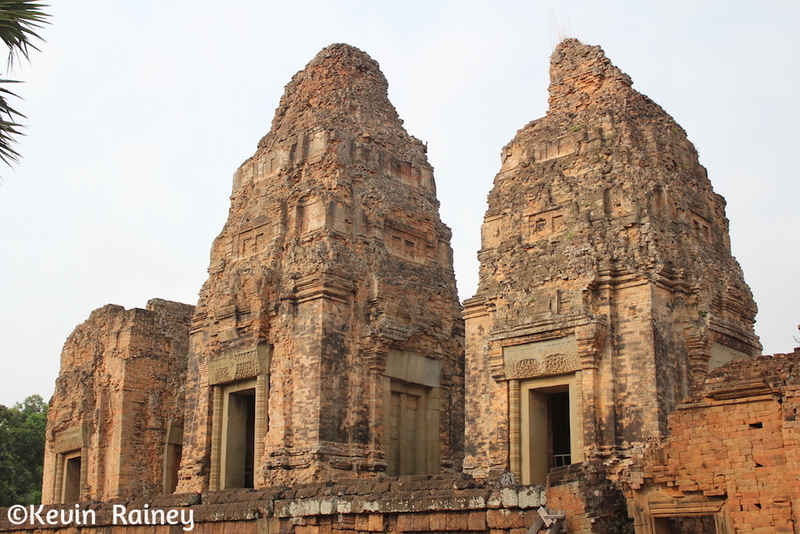 Pre Rup means ‘Turning the Body’ and refers to a traditional method of cremation. Sovonne explained that the temple may have served as an early royal crematorium. 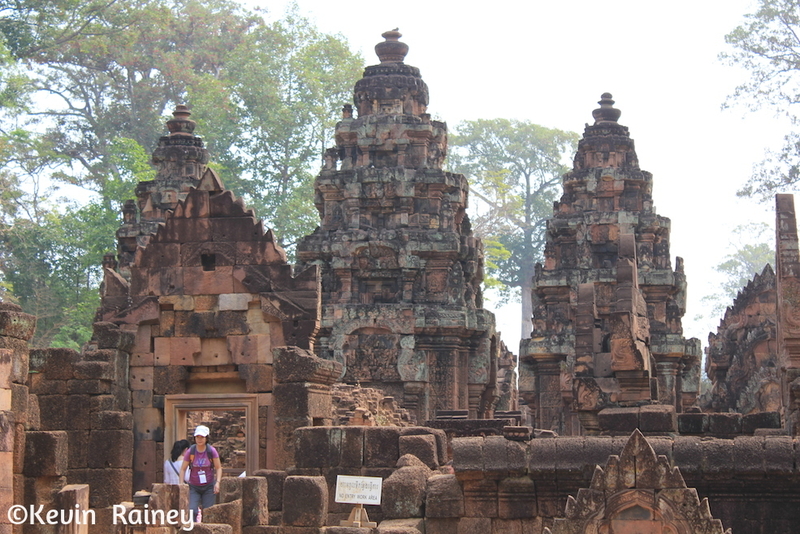 Then we visited Banteay Samre, located east of the East Baray. 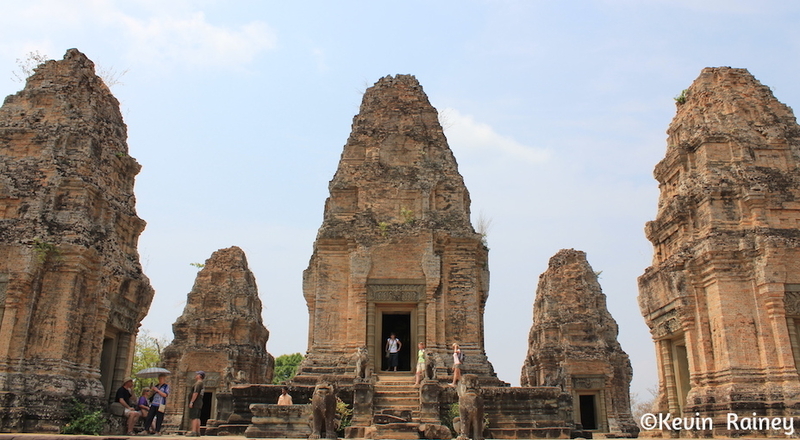 It is a Hindu Temple building in the style of Angkor Wat. The temple is not as popular as Angkor Wat, but this early 12th century is not as crowded and very beautiful. Afterwards, we visited the nearby East Mebon temple, located about 1,200 meters south of Pre Rup. East Mebon is a similarly designed 10th century temple located on an artificial island in the now dry baray. It was dedicated about eight years before Pre Rup. The temple mountain consists of two walls and three tiers constructed of brick, sandstone, laterite and stucco. Stone carvings and sculptures depict Hindu religious scenes and two-meter-high free standing elephants carved from stone crown each corner of the first two tiers. On top of the tiers is a central tower that rests on a square platform, surrounded by two smaller towers. On the way to the car, we passed a group of disabled Cambodian musicians sitting on a carpet playing traditional Khmer instruments for visiting tourists walking by to the temples. They all had lost limbs as the victims of landmines. They lived off the donations and it was another reminder that I was visiting a former warzone. Sovonne explained that many areas in Cambodia – even in the Angkor area – still contain landmines that have not been cleared or even mapped. He said we should always stick to the main trails and roads! Later we went back to the car and headed about 20 kilometers northeast of Angkor Wat towards Banteay Srei, also known as the women’s citadel. 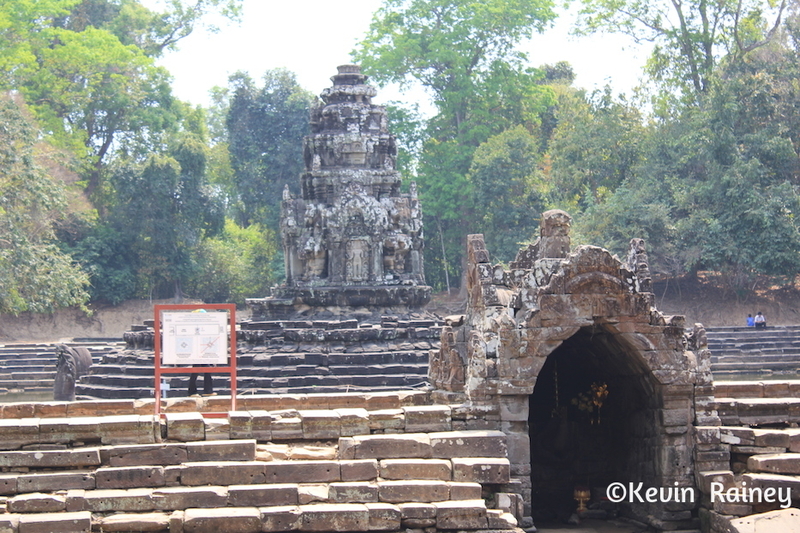 The 10th-century Cambodian temple was dedicated to the Hindu god Shiva and is situated in the middle of the forest. 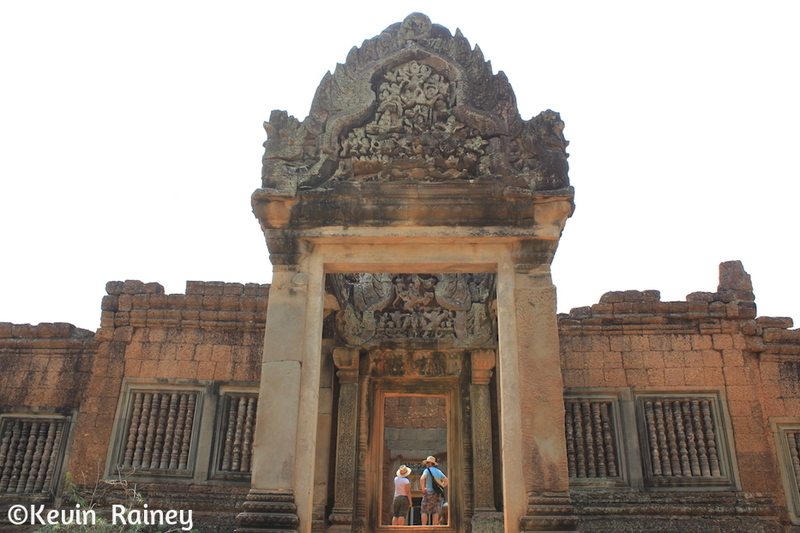 The temple is considered a jewel of Khmer art with it’s intricate carvings inscribed in red sandstone. Because it was built in remote forest, it was lost to the jungle until its re-discovery in 1914. Trees had overtaken the structure and brought down a number of its roofs over the centuries before French archaeologists help reconstruct the temple. 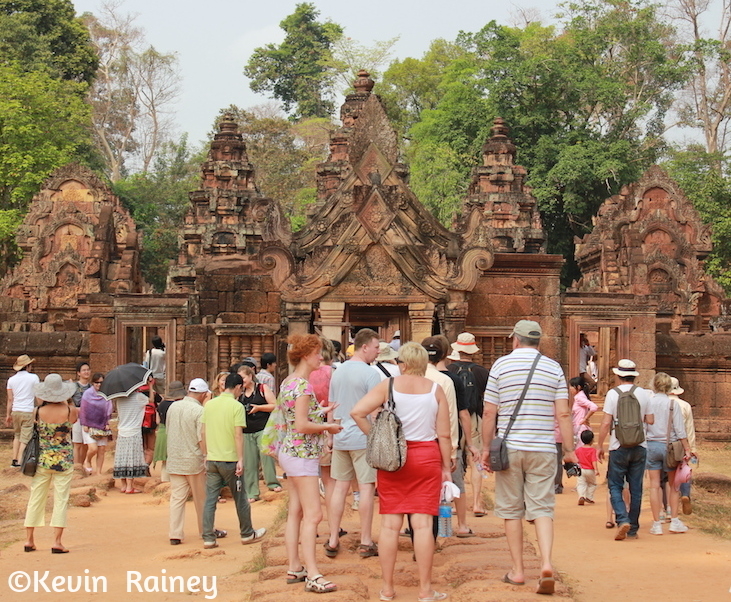 At Banteay Srei, a number of paths lead to different patios and temple buildings. Two massive sandstone and laterite libraries open to the west. Nearby I toured inside the three beautiful towers, but that I was puzzled by how bare the interiors were compared to the building’s external façade. After visiting Banteay Srei, we drove to Preah Khan, a 12th century temple built for King Jayavarman VII in the 12th century. The temple is located northeast of Angkor Thom and the name means “royal sword”) in the Khmer language. The temple is composed of successive rectangular galleries around a Buddhist sanctuary curiously surrounded by Hindu satellite temples and later additions. It was a monastic city of nearly 15,000 monks during its golden years. It was community of learning where experts of Khmer, Chinese, and Indian Ayurveda medicine learned from each other. In fact, Preah Khan was the mother of more than a hundred hospitals in the kingdom. Similar to Ta Prohm which I will see tomorrow, Preah Khan has been left largely unrestored, with numerous trees growing in the ruins. Once inside the city walls, I was surprised to see how the trees have clawed back the structures. The Central Temple is framed by eight towers and two concentric galleries. The interior of the Central Temple was originally illuminated by lamps, with the light reflected by polished bronze walls! On the walk out of Preah Khan, we saw Neak Pean. This Buddhist temple rests on a circular island in Preah Khan reservoir. It was built in the late 12th century. Apparently, the idol of the tower stood on the sacred lotus flower, the usual base for divine beings. The image would be to convey that it was spiritually floating in the lake. 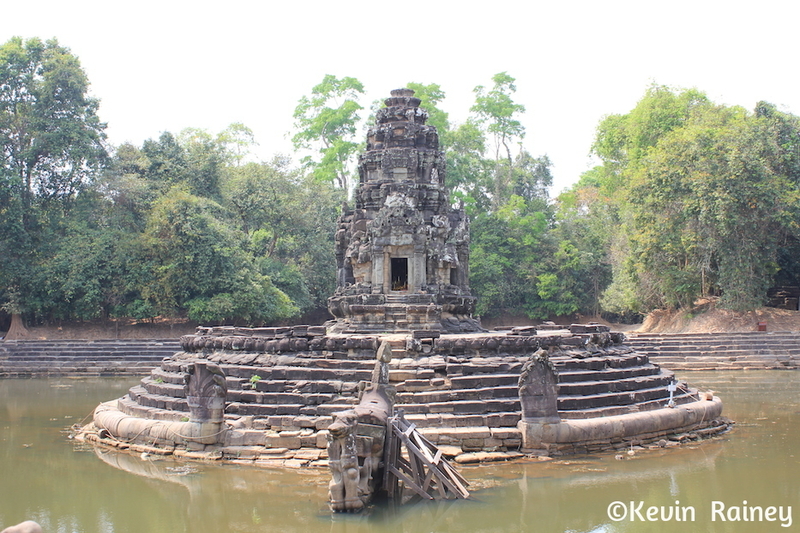 After visiting Preah Khan and Neak Pean, we drove southeast of Angkor to the Banteay Kdei monastic complex. 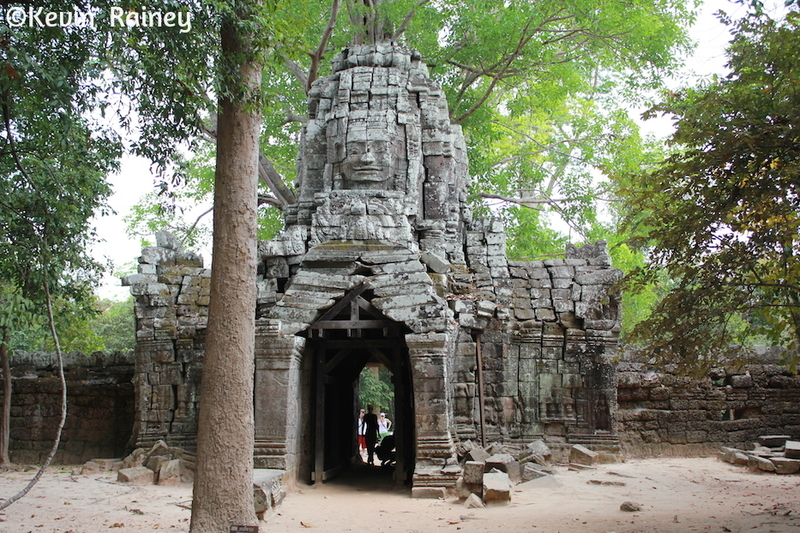 Built in the mid-12th to early 13th centuries, it is a little less complex and smaller in scale than Preah Khan Ta Prohm. It contains two successive enclosure walls and two galleries with towers rising above. 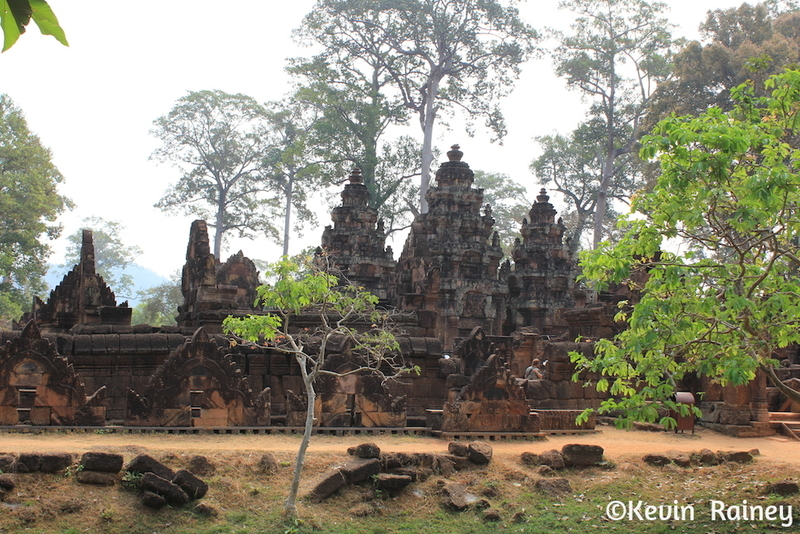 Banteay Kdei was built by Jayavarman VII, a Buddhist ruler, who didn’t follow the same designs of his Hindu predecessors. Many of the buildings have face towers, an addition from the 13th century. I marveled at four colossal Buddha faces looking into all four directions at each of the four entrance. I am told I will see larger Buddha faces tomorrow when I visit famous Angkor Thom. I thoroughly enjoyed visiting this complex. A group of stone buildings, including the temple and hall of dancers are surrounded by moat. The central tower is surrounded by four towers. A guide at the site told me how later on, builders added more galleries to connect 13 towers, each crowned with a lotus bud. Today was an amazing day, though it as hot and humid as hell. I drank a lot, but I felt very dehydrated in the near 100 degree temps and high humidity. When we finished around 3:30 p.m., we stopped at a gas station and I bought a sandwich and food for lunch. Then we headed back to the hotel. Sovonne agreed to pick me up the next morning for our sunrise tour. I chilled out at the hotel and slept for a while and cleaned up. When I woke up from my nap, I began to feel sick to my stomach. I went back to sleep before waking up around 11 p.m. I barely made it to the sink before throwing up big time in the sink and hit my head on the back of the spicket. Unfortunately, when I was in the shower cleaning up, I saw blood on a towel and realized that I hit my head on the spicket causing a gash. 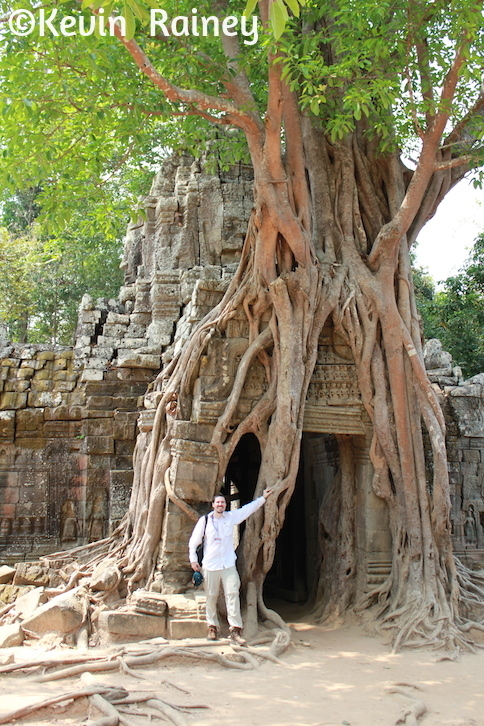 Realizing, I had a big problem and needed medical attention, I looked up two hospitals in Siem Reap in Lonely Planet. I went to the Children’s Hospital first by motorcycle taxi, but contrary to Lonely Planet, they said they only treated children and were about to close. I then caught a rickshaw to the Angkor International Hospital. Thankfully, the doctors were good and practiced clean medicine. For only the second time in my life, I would need stitches. They gave me five sutures in the back of my scalp. Here I was laying stomach down on an operating table in a Cambodian hospital. I think may have slightly offended the doctors by asking them to make sure they use sterile instruments! Afterwards I had to pay a little more than $400 in cash because they didn’t accept credit cards. Thankfully, there was an ATM. Of course my American health insurance wouldn’t cover me here, so lesson learned on buying travel insurance (I normally did but didn’t this time). Afterwards, my rickshaw driver drove me back to my hotel. Then I went back to sleep. What a day!